It’s National Children’s Dental Health Month, and in its honor, we thought we’d share the answers to some frequently asked questions for parents concerning their children’s dental health. If you’ve ever wondered how to teach your kids good brushing habits, or at what age to start taking them to the dentist, read on and we’ll answer those questions and more! When’s the right time for my child’s first trip to the dentist? As a parent, you’re no stranger to milestones. Some of the most important have to do with your child’s health and wellness, among them, their very first trip to the dentist. So, when is the right time to schedule their first dental appointment? According to the American Academy of Pediatric Dentistry, a child should see the dentist when their first tooth comes in and no later than their first birthday. When you see that very first tooth making its unscheduled appearance, it’s time to call on your pediatric or family dentist. Is it okay to use toothpaste to brush my child’s teeth? Yes, in fact, the American Dental Association recommends using a small smear of fluoride toothpaste to brush your baby’s teeth as soon as the first one appears. When you’re child reaches the age of three, it’s recommended that they graduate to using a pea-sized amount of toothpaste until the age of 6. It’s important to keep the amount of toothpaste your child uses within these recommended limits to avoid the possibility of tooth discoloration. What effect does thumb sucking have on a child’s teeth? Thumb sucking is a completely normal part of a child’s development, offering them feelings of comfort and well being. There’s no cause for alarm if you’re infant enjoys sucking his or her thumb, so don’t worry! While thumb sucking is common in infants and toddlers, if prolonged, it can lead to protruding teeth, bite problems, and jaw alignment issues. If the behavior persists past the age of three, parents should actively discourage the behavior to avoid the long-term negative effects. You might consider opting for a pacifier as a replacement for thumb sucking at an early age. Pacifier habits are easier to break, presumably because you can take them away. By contrast, their thumbs are sticking around for the long-haul. How do I teach my child good brushing habits? Start early – Even when they’re too young to understand what’s happening, clean your baby’s mouth and gums with a wet cloth or an infant toothbrush (with just water) at bath time. Not only does this prepare your baby’s mouth and gums for the brushing that’s to come, it helps parents get into the routine of brushing their child’s teeth every day. Include your child in the process – Your child is much more likely to enjoy teeth brushing if they feel like they have a hand in the process. If they’re old enough, let them choose the color of their toothbrush when you’re picking it out at the store. If their fine motor skills allow, let them pick up their toothbrush and/or toothpaste from its holder during your twice-daily tooth brushing routine. Make brushing your teeth fun! – As an adult, you know that when something’s fun, you want to do it again and again. Apply this to your child’s teeth brushing routine by adding an element of fun so they can’t wait until the next time they get to brush their teeth! Try this catchy tune about teeth brushing, or use one of these great dental health games and activities for families. 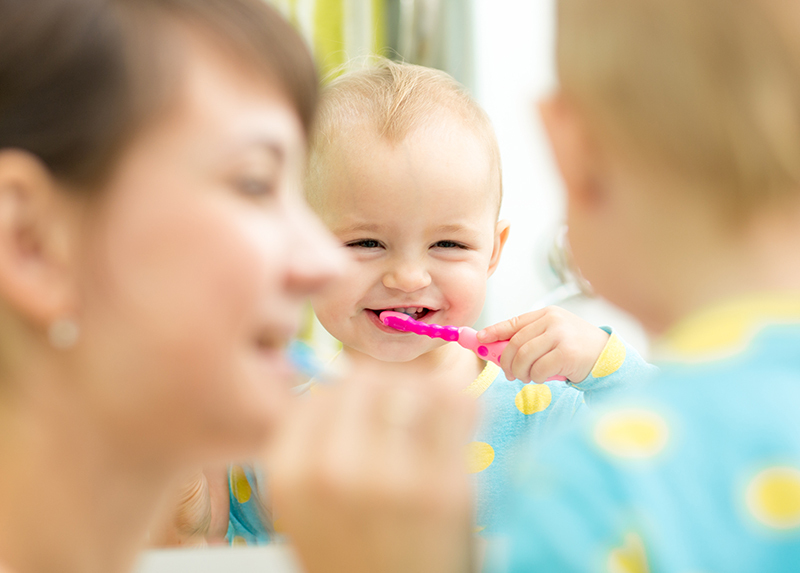 Proper oral health is an important part of early child development, so keep asking questions and getting answers. If you live in the Parma Heights area and want to schedule a dental visit for your infant or toddler, call Dr. Wolnik at (440) 888-5055, or book an appointment straight from our website (click on the green “Book an Appointment” button). This entry was posted in At-Home Dental Care, Children's Dentistry, General Dentistry and tagged Children's Dentistry. Bookmark the permalink. Follow any comments here with the RSS feed for this post. Both comments and trackbacks are currently closed.